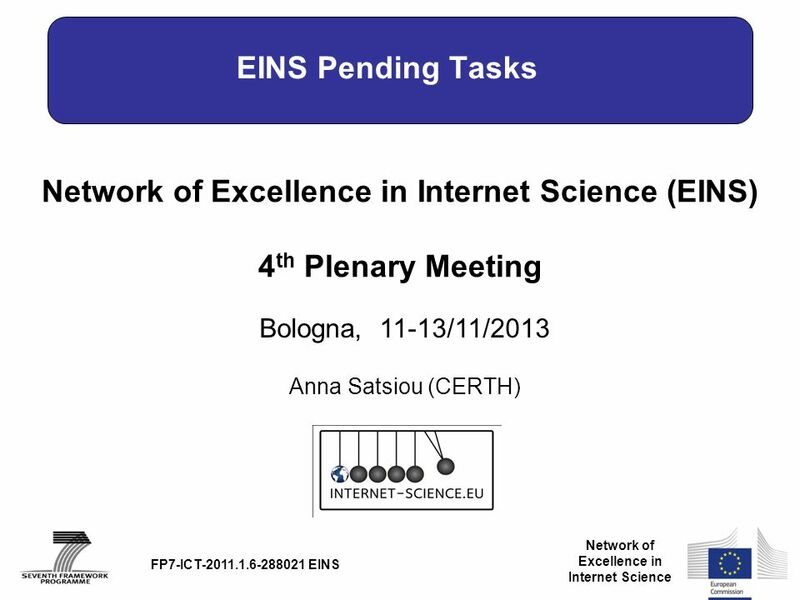 Network of Excellence in Internet Science Network of Excellence in Internet Science (EINS) 4 th Plenary Meeting Bologna, 11-13/11/2013 FP7-ICT-2011.1.6-288021. 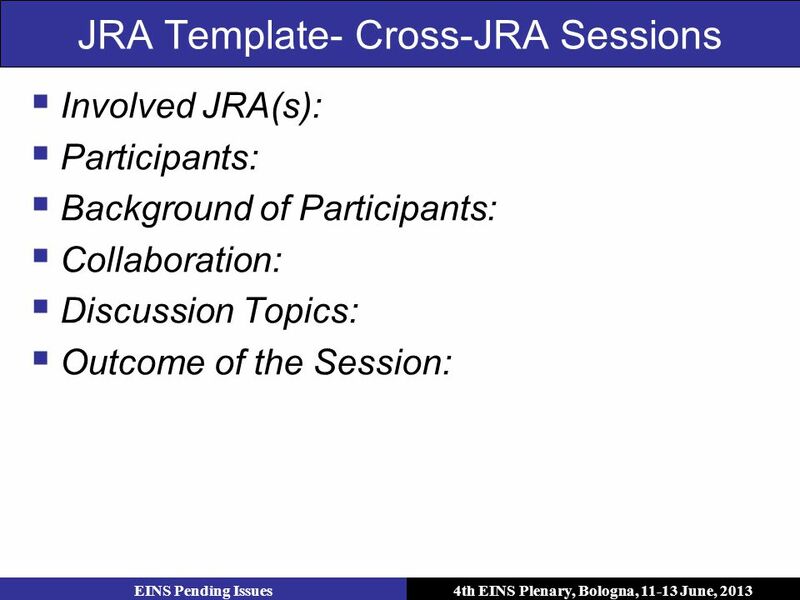 Download ppt "Network of Excellence in Internet Science Network of Excellence in Internet Science (EINS) 4 th Plenary Meeting Bologna, 11-13/11/2013 FP7-ICT-2011.1.6-288021." ICT research priorities and recommendations for strategy development in the WBC Ulrike Kunze / PT-DLR, Germany Consultation session on recommendations. 1 GEOSS Monitoring & Evaluation. 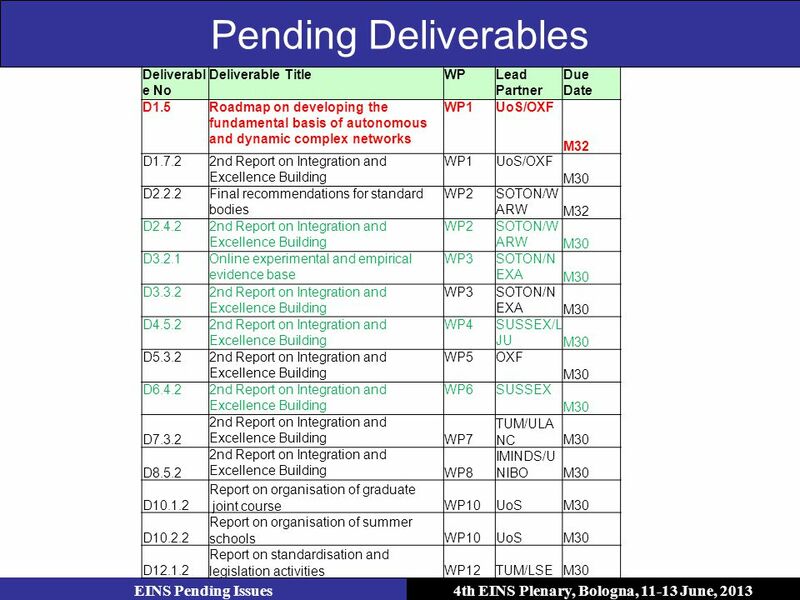 2 1st GEOSS M&E WG meeting outcomes Agreed on 1.the final draft of Terms of Reference for the M&E WG 2.The plan for delivery. COBECOS SIXTH FRAMEWORK PROGRAMME PRIORITY 8.1 WP 4 – DATA HARMONISATION London, 5 – 7 September. Linn OHLSSON, IATI Secretariat Rudolphe PETRAS, Development Co-operation Directorate, OECD IATI Steering Committee, 3 October 2013 The Common Standard. 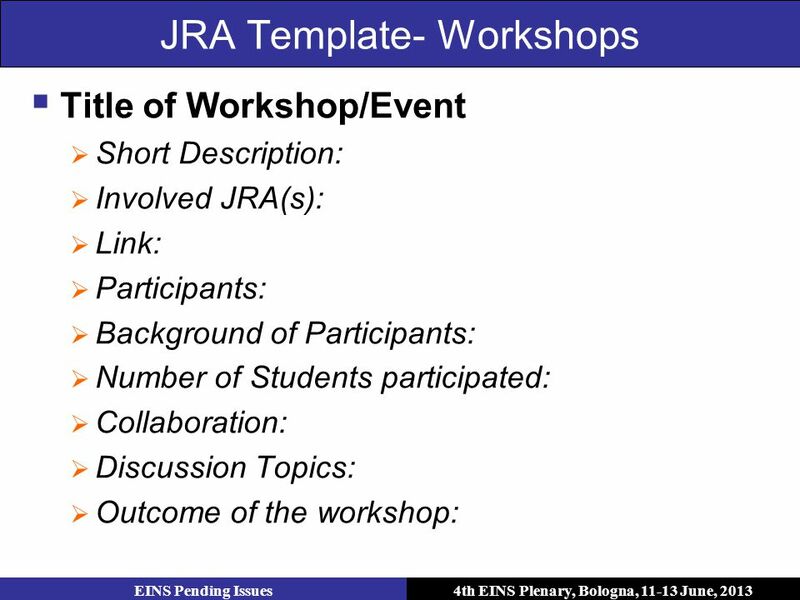 Network of Excellence in Internet Science Joint EINS Workshop/ 4 th Plenary Meeting Event Bologna, 11-13/11/2014 FP7-ICT EINS Anna Satsiou. ICT10 (2015) - Collective Awareness Platforms for Sustainability and Social Innovation Tap the innovation potential of bottom-up solutions based on collective. 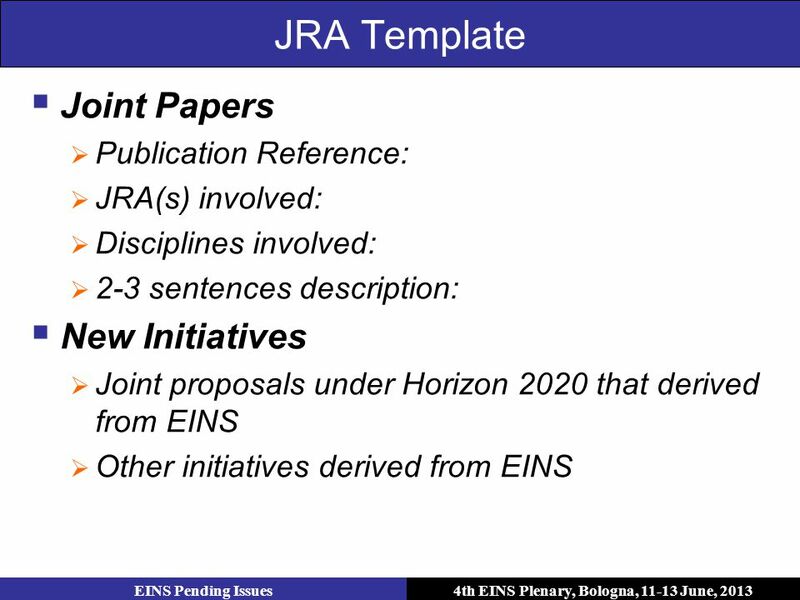 Aims: HERODOT II ( ) HERODOT II will: produce guidelines from TUNING and other research, to promote the role of Geography and the employability. 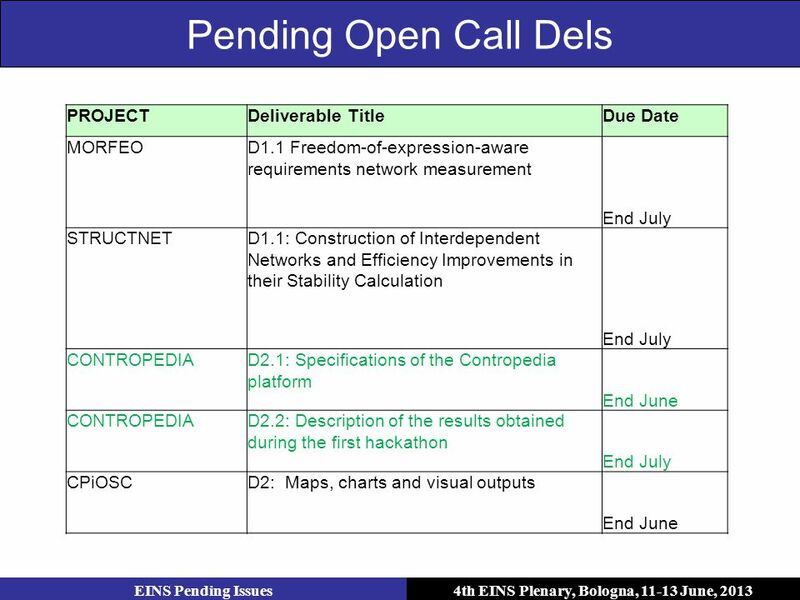 Network of Excellence in Internet Science 3 rd EINS Summer School Volos, July 2014 Anna Satsiou (CERTH) FP7-ICT EINS Network of Excellence. UIA Associations Round Table – Europe 2014 Dublin, November 2014 Achieving impact and finding the funds Dr Dragana Avramov PSPC, Brussels 14/11/2014www.avramov.org1. / department of mathematics and computer science TU/e eindhoven university of technology CEDEFOP workshop: Policy, Practice, Partnership: Getting to Work. State of the Art in Theory and Practice of Rural Development Measures Partner 4: The University of Wales Aberystwyth. Headquaters Kick-Off Meeting Brussels 17 January 2013 Aware and Resilient Project overview – Austrian Red Cross. 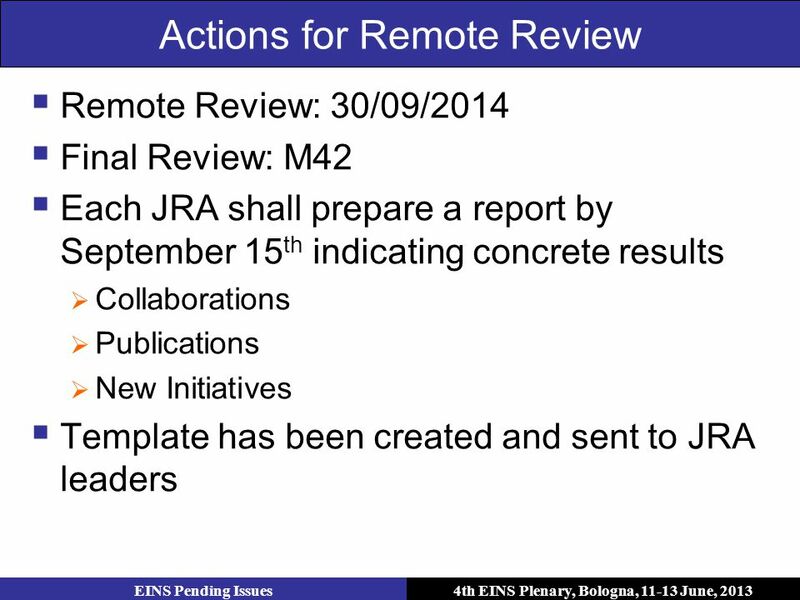 DOCUMENT #:GSC15-PLEN-08 FOR:Presentation SOURCE:ISACC AGENDA ITEM:Opening Plenary (4.5) CONTACT(S):Jim MacFie ISACC Activities Since GSC-14 Jim MacFie. 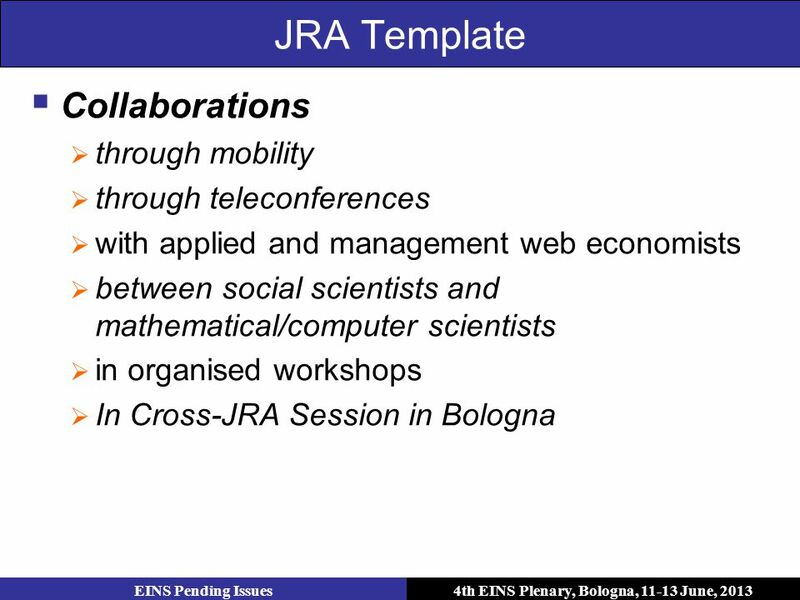 Network of Excellence in Internet Science Network of Excellence in Internet Science (EINS) 4 th Plenary Meeting Bologna, 11 - 13 June 2014 FP7-ICT-2011.1.6-288021.